Marianne Lindberg de Greer’s statue Bronskvinnorna, shown in the photograph above, is alternatively titled “I think of myself” and both female forms bear the artist’s face. 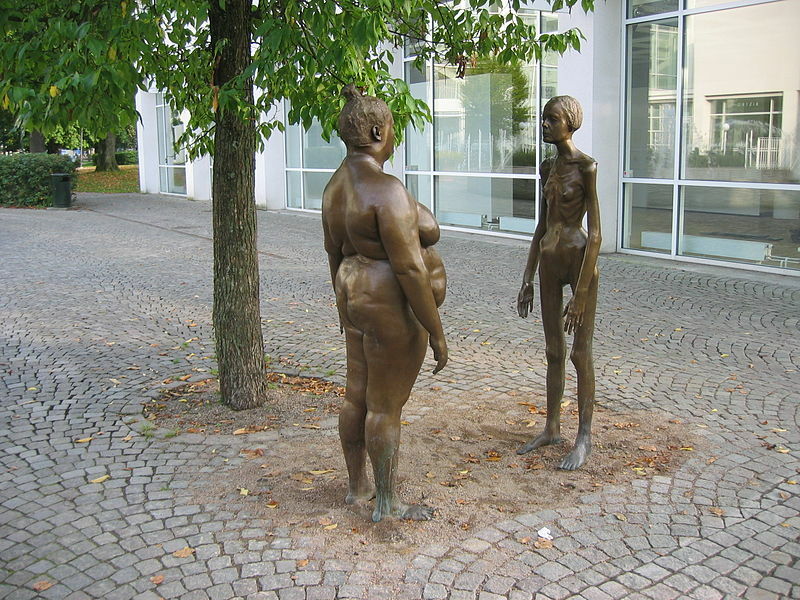 De Greer created this piece as a demonstration against modern society’s obsession with how we look and as an encouragement to society to see people of all body types as having equal value. The authors of this week’s readings express similar sentiments as they write in response to the fact that, as Susan Bordo puts it, “whether externally bound or internally managed, no body can escape either the imprint of culture or its gendered meanings” (p. 109). As I read about slender bodies and fat bodies, anorexia and obesity, compulsivity and obsession, I found myself in an intellectual wrestling match with the fat activists. I don’t know that I have come to satisfying conclusions just yet, but hopefully writing this entry will help me flesh out my thoughts a bit more. I agree with Tyra that it is really sad to see such beautiful people internalize so much hate towards their own bodies. That being said, I worry a little bit about the glorification of fat bodies glossing over the physical difficulties that are undeniably related to being overweight. For example, excess weight wears heavily on hip and knee joints. Obesity makes physical exercise more difficult because just carrying yourself can become laborious. On another episode of the Tyra show (the online video has been removed, so I can’t post it here) a woman named Donna talks about how she is 600 pounds and wants to reach her goal of 1000 pounds. She has to take breaks just walking to the mailbox and says that generally speaking, she hates moving. This woman loves her body, which is great, but she is killing herself through her efforts to maintain (and expand) that large body. Clearly this is an extreme example, but I relay it in order to say that, although I agree with Harding’s claim that weight in and of itself is not a health problem, at a certain point, too much weight makes a sedentary lifestyle hard to avoid. Ultimately, I agree with the authors who argue that in our discussions of weight and body size we often turn our own flesh into the enemy or, at the very least, into an object to be mastered and controlled. I praise these authors for their efforts to advocate positive self-images for all body types, and I hope we are learning to love ourselves and each other as whole people (intellect, personality, appearance, and health). I have almost exactly the same discomforts. I admire the work Kate Harding and others are doing. And yet, most of the online venues promoting fat acceptance don’t allow *any* discussion of the ill effects of fat. The dangers of obesity are exaggerated and horribly moralized, but that doesn’t mean they are negligible. Your point about joints, in particular, is one I’ve thought about a lot. One reason I don’t want to gain excess weight is that I already have trouble with my feet. I remember what a strain it was to lug around the weight of pregnancy. I don’t want to have joint replacement surgery if I can avoid it! I see my mother’s friends going through it, and I am positive that fewer would need it if they were not overweight. Recovery would be easier for those who still had to undergo surgery. The problem for the fat acceptance movement is that it’s currently almost impossible to talk about health problems without moralizing and shame entering into the discussion. Fat activists strike back by trying to stop all discussion of health issues. And so we’re stuck in a vicious circle. Such a well thought out post. I just finished writing a post of a similar nature, and while looking for an appropriate image, stumbled across your visual of the Women in Bronze. Thank you for your candor and your perspective, one that is no doubt as important as that of the crusaders.